The AAS is reaching out to its emeritus members and those who have belonged to the Society for at least 40 years to recognize them for their long-term support and to explore how better to serve this group. An ad-hoc committee has been set up to lead this effort, chaired by Lee Anne Willson (Iowa State University) and including Bruce Balick (University of Washington), Jay Pasachoff (Williams College), and Nancy Morrison (University of Toledo). Emeritus membership is available to individuals who have been AAS members for at least 10 contiguous years and who have retired from gainful employment. Emeritus status carries reduced dues, reduced meeting registration fees, and other advantages. If you are eligible but have not yet applied, please contact Diane Frendak, AAS Director of Membership Services. Similarly, if you have been a member of the AAS for 40 years or more and have not already been contacted about becoming part of the "40+E" group, please contact Diane Frendak. 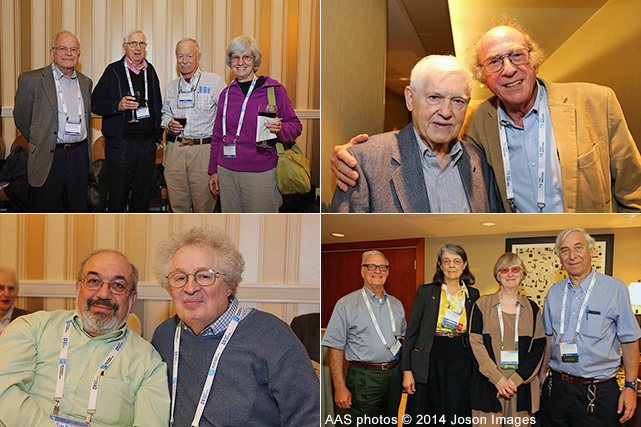 A new feature of most AAS meetings is a special social hour for 40+E members, providing an opportunity to meet old friends and make new ones in a quiet space and to discuss topics of mutual interest. Ideas and activities that have been suggested for the group include working with the Historical Astronomy Division on oral and written records of our time in astronomy, networking for opportunities for volunteer projects relevant to our expertise and interests, and exploring opportunities to mentor or assist younger colleagues or small departments. One constraint is that we should give more than we receive when it comes to AAS resources, so we will probably form a committee or club to take responsibility for our projects and work through the AAS only for tasks that are easy for them and not so much for us — such as generating an up-to-date mailing list of eligible AAS members. To facilitate discussion among 40+E members and to make it easy to provide feedback to the ad-hoc committee, we have set up an email listserv (40e@aas.org) for 40+E members. The listserv is hosted by Google Groups. 40+E members are welcome to share ideas, opportunities, and concerns via the listserv. Topics that are likely to be useful include making the transition to retirement (and negotiating a good retirement package), arranging for archiving of historically interesting papers and photographs, and identifying interesting volunteer opportunities for retired astronomers. If you wish to manage your preferences on the 40+E listserv, you need to have at least a basic Google account. If you don't already have one, you can create one. Google has a process that will walk you through linking an email address to a Google account; you don't need to create a new email address in order to have and use a Google account. Subscribe: To join the 40+E listserv by email, send a message to 40e+subscribe@aas.org. Be sure to follow the instructions in the confirmation email that you'll then receive. You may also join the 40+E listserv online. What happens when you follow that link depends on whether you already have a Google account and on whether you're already logged in to it. Unsubscribe: To unsubscribe from the 40+E listserv at any time, send an email message to 40e+unsubscribe@aas.org. Alternatively, for those of you on Facebook, we have set up a Facebook group, 40+E Members of the American Astronomical Society. To join, go the group's page on Facebook and click the green "+ Join Group" button. Once your request has been approved, you may join the discussion and share ideas, opportunities, and concerns just like on the listserv.